Orbital ATK’s upgraded Antares rocket, featuring newly-built RD-181 main engines, completed a 30-second test firing on a launch pad on Virginia’s Eastern Shore on Tuesday. The hotfire test is a key step before the Antares rocket returns to flight in July, resuming cargo service to the International Space Station from Virginia. Working from a control center several miles away at NASA’s Wallops Flight Facility, the Antares launch team oversaw filling of the rocket’s Ukrainian-made core stage with kerosene and liquid oxygen propellants Tuesday. 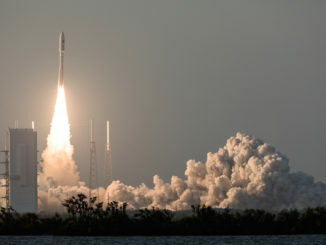 A computer-controlled sequencer took over the final stages of the countdown, which concluded with ignition of the rocket’s two RD-181 engines at 5:30 p.m. EDT (2130 GMT). Hold-down restraints at pad 0A at the Mid-Atlantic Regional Spaceport, a state-owned facility on Wallops Island, kept the Antares vehicle firmly grounded for the test firing. Engineers plan to review data from the hotfire test in the coming days to ensure all systems performed as designed before Orbital ATK resumes Antares cargo launches to the International Space Station in July. The hotfire test Tuesday came after a successful wet dress rehearsal May 22, in which the launch team loaded propellants into the rocket but halted the countdown before ignition of the main engines. Tuesday’s hotfire demonstrated several operational launch procedures, Orbital ATK said, including the full propellant loading sequence, launch countdown, engine ignition and shutdown commands, as well as multiple throttle settings. Ground crews will remove the Antares test vehicle, which comprises just the first stage of the two-stage launcher, from pad 0A in June and roll it back to Orbital ATK’s rocket processing hangar, where it will be readied for a mission scheduled later this year. A separate booster inside the Horizontal Integration Facility at Wallops is assigned for the next Antares launch — the first flight of the medium-lift rocket since an explosive mishap moments after liftoff in October 2014 destroyed a space station supply ship and damaged the seaside launch pad. The engine firing Tuesday tested the launch pad’s repairs, such as the fueling and water deluge systems. The OA-5 mission is tentatively scheduled for liftoff July 6 at around 12:49 p.m. EDT (1649 GMT), when the Antares booster will send Orbital ATK’s Cygnus commercial cargo craft to the International Space Station. An official target launch date will be set by Orbital ATK and NASA after the data review following Tuesday’s hotfire test. After the 2014 launch failure, Orbital ATK accelerated plans to replace the Antares rocket’s AJ26 engines, which were built more than 40 years ago for the Soviet-era N1 moon rocket, with newly-manufactured RD-181 engines from NPO Energomash of Moscow. Orbital ATK’s investigation blamed the 2014 rocket crash on a decades-old manufacturing defect in the liquid oxygen turbopump of one of the AJ26 engines. The first pair of new RD-181 engines arrived at the Virginia launch base from Russia in August 2015, followed by a second set in December. Another shipment of engines is due soon. During Tuesday’s test, the engines were programmed to fire up to full power — equivalent to more than 800,000 pounds of combined thrust — and go through a steering check as the control computers throttled the engines to different thrust levels they will see in flight. The Antares rocket’s new propulsion avionics package, made in-house by Orbital ATK for the RD-181 to replace an engine controller previously made by Moog, was also put to the test during Tuesday’s hotfire. The RD-181 engines are about the same size as the AJ26s it replaces, minimizing changes to the launch pad mount and the first stage structure. Engineers designed a new apparatus to connect the RD-181 engines to the stage. 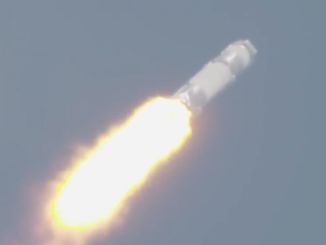 The RD-181 engines produce more thrust and burn more efficiently than the AJ26 engines, giving the upgraded Antares the ability to lift heavier cargo into orbit. The new Antares configuration, called the Antares 230, can haul up to 15,400 pounds (about 7,000 kilograms) into the International Space Station’s orbit, according to John Steinmeyer, director of strategy and business development for Orbital ATK’s launch vehicle division. That is an increase over the 12,800-pound (5,800-kilogram) payload capacity of the Antares rocket with AJ26 engines. Those figures encompass the entire weight of the Cygnus spacecraft, not just the cargo packed inside. 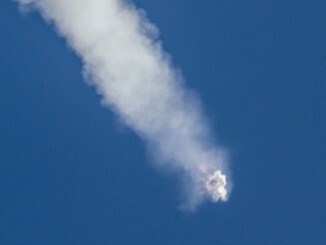 In the wake of the 2014 launch failure, Orbital ATK purchased two Atlas 5 rocket flights from United Launch Alliance to carry Cygnus supply ships to the space station in December 2015 and March, continuing the company’s execution of a more than $2 billion contract covering 11 logistics missions to the outpost. The OA-5 mission set for launch in July will be the sixth of 11 operational space station cargo runs planned by Orbital ATK under an extended contract first signed with NASA in 2008. Orbital ATK won a contract for another batch of at least six additional resupply flights earlier this year.